You’re invited to participate in a special Liberty! 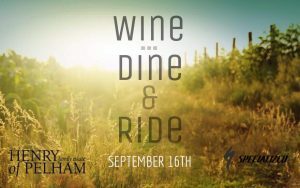 Bicycles, Specialized Bicycles & Henry of Pelham Family Estate Winery event that combines three beautiful things: wine, food and (of course) cycling on September 16th, 2018. Join in for an afternoon of easy riding through Niagara’s back roads courtesy of our electric-assist bicycles. We will stop along the way for a wine tasting at Henry of Pelham and a three-course lunch before enjoying a leisurely ride back. Cost of ride is $150/person or $300/couple +HST (includes Specialized Turbo electric-assist bike rental, wine tasting and three-course lunch with wine at Henry of Pelham) Space is limited. Contact Liberty! Bicycles to register.